Everything about putting the puck in the net, improving your puck-handling, scoring and decision making abilities. Students will spend their time working on different ways of shooting, and also on reading the movement of goalies and defensemen, tipping, deflecting, passing, deking, faking, camouflaging, staying "open". Plenty of time will be spent on improving their puck-handling abilities with work on shifting, rotating, pulling... As well as on improving their skating speed, skaters ability. This program will also provide many confrontational situations that our students will complete in order to challenge and further develop their hockey skills. In this particular Camp, we will be challenging the skaters to improve their skill-sets in Quickness, Agility, Stick-handling and Scoring. By narrowing in on the details we are able to further enhance their abilities as well as motivation, attitude, self-esteem and confidence. A large focus will be on developing the skaters foot-speed, agility and overall confidence skating with and without the puck. With the skills learned here we can maximize the players puck-handling, fakes acceleration, deception, shooting, passing and decision making skills as they become a vital part of our action on the ice. Everything about putting the puck in the net, improving your scoring and decision making abilities. Students will spend their time working on different ways of shooting, and also on reading the movement of goalies and defensemen, tipping, deflecting, passing, deking, faking, camouflaging, staying "open". Plenty of time will be spent on improving their puck-handling abilities with work on shifting, rotating, pulling... As well as on improving their skating speed, skaters ability. This program will also provide many confrontational situations that our students will complete in order to challenge and further develop their hockey skills. (25 hrs on ice + 5 hrs off ice flexibility, agility, foot speed and stick-handling training) A more position specific camp where the defensemen and forward skaters will be split into two separate groups to work on skill-sets specific to their position on the ice. It will also be very interactive with lots of time for competition between the skaters to work on the aspects they have been training on individually. 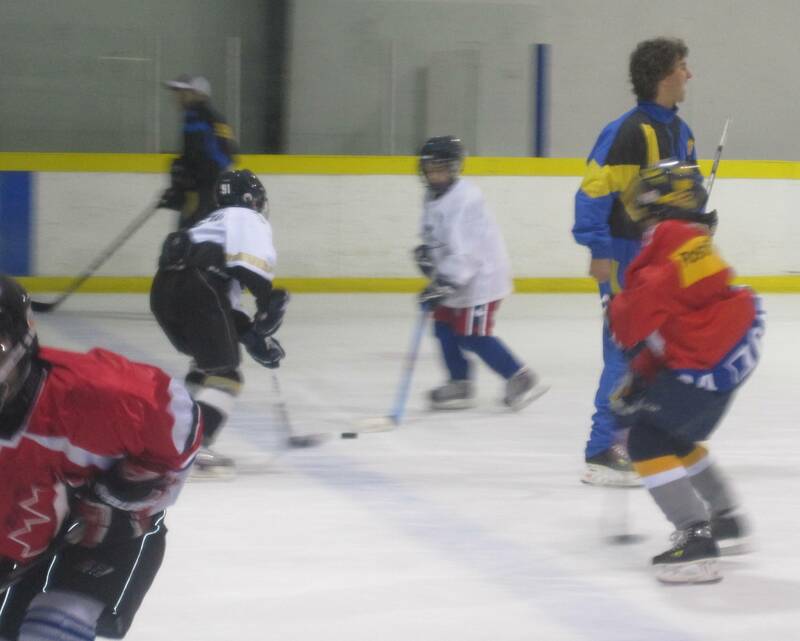 In this camp many hockey situations will be used to learn and work on details of scoring as well as preventing goals. The students will be exposed to drills designed to teach and encourage the defenseman offensive skills and ( vice versa ) the offenseman how to understand his defensive responsibilities, all in light of becoming the best player they can be. This program incorporates creative European and North American methods in developing speed, agility, quickness and combines it with other facets of hockey training like puck-handling and scoring. The focus will be placed on acceleration and improving the foot speed with the puck as well as edge and ankle movement, "short ice" reaction and response with elements of deking, faking, checking, shooting and 1 on 1 that will also challenge the students creativity in various "around the net" situations. Week 6 Group C is based on a smaller number of players (21-23) focusing on skating, stride, speed, acceleration, agility, puck-handling and scoring abilities. This class will connect the focus on different facets of hockey training and with fewer students in the class we will offer more attention to each students individual needs. In this camp our attention will be directed to areas of skating, agility, puck-handling, speed, passing, shooting and checking. Students will learn about stride, edge control, footwork as well as advanced skills in puck control with rotations, rolls, pulls, shifts and extensions. Students will also learn about release, accuracy and different techniques of shooting. Furthermore they will participate in 1 on 1s and 2 on 1s to develop their defensive ( checking, playing the man ) and offensive ( faking, deking ) abilities. This program incorporates creative European and North American methods in developing speed, agility, quickness and combines it with other facets of hockey training like puck-handling, scoring and checking for defensemen and forward players. The focus will be placed on acceleration and improving the foot speed with the puck as well as edge and ankle movement, "short ice" reaction and response with elements of deking, faking, checking, shooting and 1 on 1s that will also challenge the students creativity in various "around the net" situations. 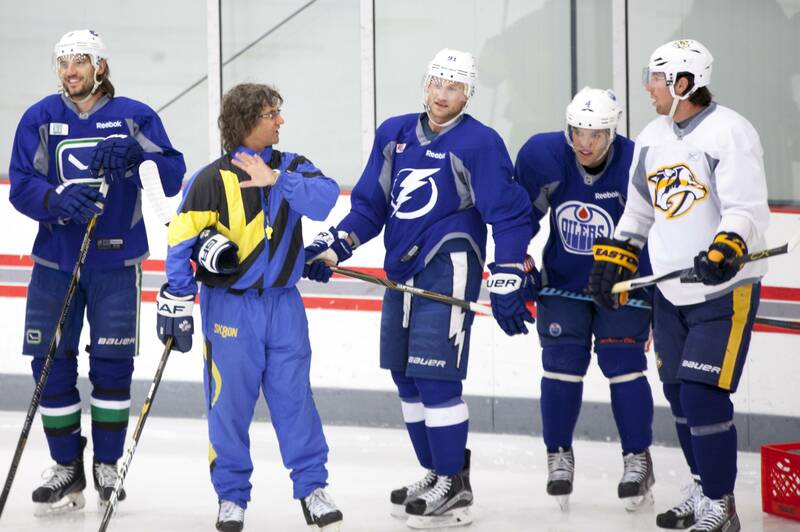 The Hockey News has named Jari Byrski as one of the Top 100 most influential people in the Hockey World.